Former San Francisco Mayor and Lt. Gov. Gavin Newsom has won the race to be California's new governor. The remains of a U.S. Army soldier missing since the Korean War have been identified as belonging to a San Francisco resident. The annual state budget included nearly $3 million to complete the restoration of the Pacific Coast Immigration Center at Angel Island. One civilian has died in the Valley Fire, Cal Fire officials have confirmed tonight. Gov. Jerry Brown announced a revised plan to build large tunnels to pump water from the Sacramento-San Joaquin Delta. Gov. Jerry Brown Wednesday set a new target for greenhouse gas reduction in California. Contra Costa Water District Board of Directors voted Wednesday to require a 25 percent reduction in water use. Gov. Jerry Brown's office announced 83 pardons Sunday, according to the governor's office. Lt. Gov. 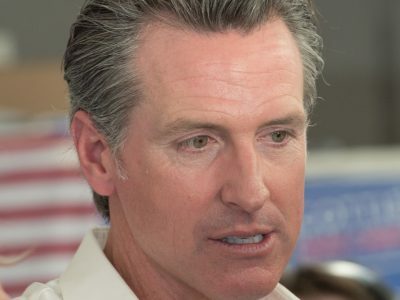 and former San Francisco Mayor Gavin Newsom announced Wednesday he is running for governor in 2018.